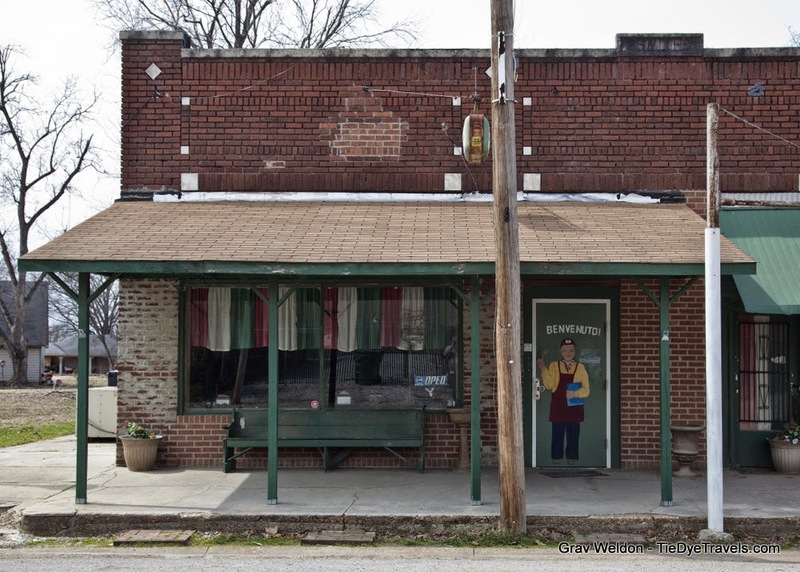 A tiny Delta town is home to some of the best homemade pasta for a hundred miles around, an unadvertised Italian place with deep family ties. 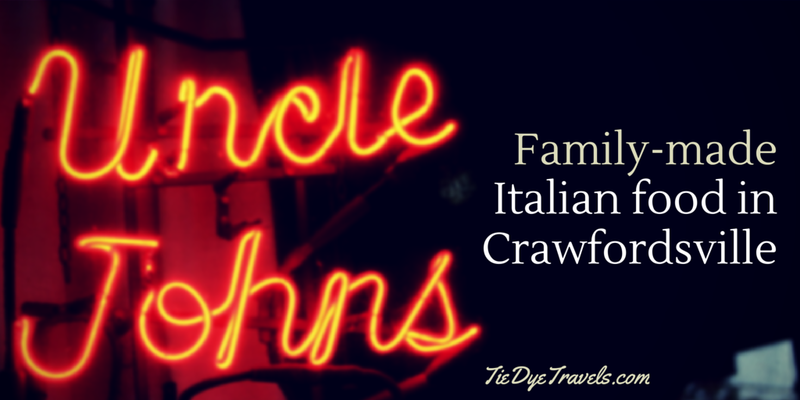 That place is Uncle John’s – an improbably comfortable eatery that manages to survive on word-of-mouth. Indeed, I wouldn’t have found it had it not been for the recommendation of fellow writer Rex Nelson, who keyed me in on the place. And now I’m going to share that secret with you. The restaurant sits in the last remnants of Crawfordsville’s downtown area, a lone storefront with a field on one side and the hull of a long-dead business on the other. The door is metal and heavy, but inside you’ll find the vestiges of many older restaurants – concrete floor, mismatched chairs and a host of local articles framed on the walls. This is community center. cooking for friends and family. The Marconis bought the restaurant from Lucille’s sister, who was about to close it down. They started serving the family’s Italian recipes along with hamburgers and cold sandwiches (and on Fridays, catfish). Now, John didn’t believe in advertising. He thought that if the food was good, people would come and share the word. He was right. The word has been passed slowly over the years, and folks seek this place out regularly. The Marconis had seven children. The youngest, Michael, stayed, and when John passed away in 1994, Michael took over the running of the restaurant. Now, I’ve had good-looking food at Uncle John’s, and I’ve had terrible-looking food there too. 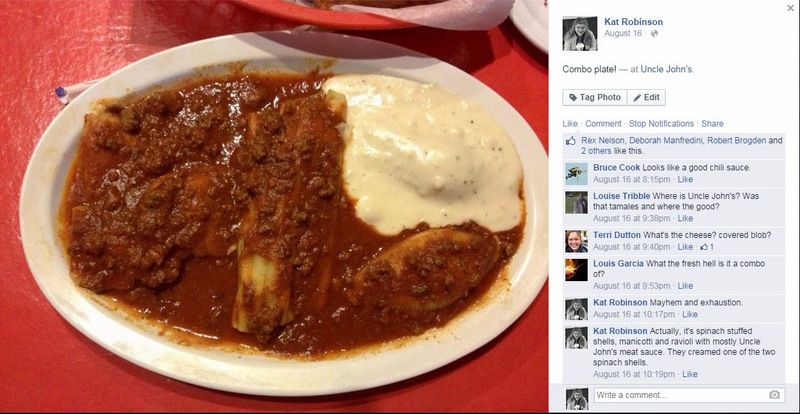 This photo taken with my phone shows a dish that heated up social media… folks could not figure out what this was. That, my friends, is Uncle John’s Combination Dinner. It’s a chance to sample around the menu. That menu’s pretty vast – it includes steaks, ribs, barbecue, toasted ravioli and spaghetti and a lot of pasta. JUST with the pastas, there are hand-stuffed shells (with your choice of meat or spinach filling or both), meat stuffed manicotti, meat and cheese stuffed ravioli, spaghetti and meatballs and cheese-filled lasagna. On that particular night, I had my combo with the manicotti, ravioli and stuffed shells, all with the meat sauce except the spinach shell, which I had with the cheese sauce. Let’s just say the presentation lacked. But everything on that plate was rich, fully spiced and well-enjoyed, especially with the big slices of house made bread offered. Why did I show that first? Because I’m funny that way. Here’s some more attractive items. One time when I walked through the door I was told before I sat down that I’d want the fried mushrooms. They were served almost too hot to handle with a creamy homemade ranch-ish (but not quite ranch) sauce, and they were marvelous. The salad dressings are homemade. I’d take home a quart of this blue cheese dressing if they’d let me… of course, the Marconis and their staff are nice enough, they probably’d make me an offer if I asked. The toasted ravioli, made by hand with a beef and cheese filling, is always a winner. In fact, I’d say if I had to choose just one item to order, it’d be that one item about 50 percent of the time. Crispy and dusted with parmesan cheese, packed with those spices, they’re hearty. The other item I’d consider as my one-and-only would be the lasagna: layers of cheese, sauce and pasta, very simple but very tasty and nicely filling. That’s my order for anyone going out there who’s going to bring me back a box. The signature dish for which the place is know, though, is ribs and spaghetti. The ribs are nicely smoked, fall-off-the-bone wonders and the spaghetti is… spaghetti, but that’s all right, not only because it’s good but because ribs. But what you really need to get, no matter what else you get, is the bread pudding. It’s far different from anything else you’re going to find. See, Lucille Marconi didn’t care for traditional bread pudding, especially how it was served in New Orleans, because it invariably contained raisins. The texture was different, too. The Marconis tried a lot of things, but one night when they were out of other sorts of breads, they resorted to hamburger buns. The softer buns absorbed the egg, milk, sugar and bourbon custard to create an amalgamated pudding both delicate and assuredly firm enough to slice. It’s topped with a marvelous bourbon sauce (though, if you ask nicely, you can have yours topped with lemon sauce instead). It’s always heated, and that warm fulfillment at the end of a meal is about enough to put you to sleep; though, with no hotels nearby and considering the great distance you’d have to go to get anywhere with a bed, you’d best get yourself a driver. When you go, make sure you take time to survey the second room. There’s a mural that takes up an entire wall, painted by local artist Joann Bloodworth, that depict just about every town resident in a setting reminiscent of a Tuscan village. one of our trips. Note the "Italian slaw." next time you decide to cross the river into Tennessee for your return trip. Ribs and spaghetti? Yes PLEASE!